The World Health Organization (WHO) recommends acupuncture as an effective treatment for over forty medical problems, including allergies, respiratory conditions, gastrointestinal disorders, gynecological problems, nervous conditions, and disorders of the eyes, nose and throat, and childhood illnesses, among others. Acupuncture has been used in the treatment of alcoholism and substance abuse. It is an effective and low-cost treatment for headaches and chronic pain, associated with problems like back injuries and arthritis. It has also been used to supplement invasive Western treatments like chemotherapy and surgery. Acupuncture is generally most effective when used as prevention or before a health condition becomes acute, but it has been used to help patients suffering from cancer and AIDS. Acupuncture is limited in treating conditions or traumas that require surgery or emergency care (such as for broken bones). The original text of Chinese medicine is the Nei Ching, The Yellow Emperor's Classic of Internal Medicine, which is estimated to be at least 2,500 years old. Thousands of books since then have been written on the subject of Chinese healing, and its basic philosophies spread long ago to other Asian civilizations. Nearly all of the forms of Oriental medicine which are used in the West today, including acupuncture, shiatsu, acupressure massage, and macrobiotics, are part of or have their roots in Chinese medicine. Legend has it that acupuncture developed when early Chinese physicians observed unpredicted effects of puncture wounds in Chinese warriors. The oldest known text on acupuncture, the Systematic Classic of Acupuncture, dates back to 282 A.D. Although acupuncture is its best known technique, Chinese medicine traditionally utilizes herbal remedies, dietary therapy, lifestyle changes and other means to treat patients. In the early 1900s, only a few Western physicians who had visited China were fascinated by acupuncture, but outside of Asian-American communities it remained virtually unknown until the 1970s, when Richard Nixon became the first U.S. president to visit China. On Nixon's trip, journalists were amazed to observe major operations being performed on patients without the use of anesthetics. Instead, wide-awake patients were being operated on with only acupuncture needles inserted into them to control pain. During that time, a famous columnist for the New York Times, James Reston, had to undergo surgery and elected to use acupuncture instead of pain medication, and he wrote some convincing stories on its effectiveness. Today, acupuncture is being practiced in all 50 states by over 9,000 practitioners, with over 4,000 MDs including it in their practices. Acupuncture has shown notable success in treating many conditions, and over 15 million Americans have used it as a therapy. Acupuncture, however, remains largely unsupported by the medical establishment. The American Medical Association has been resistant to researching it, as it is based on concepts very different from the Western scientific model. Several forms of acupuncture are being used today in America. Japanese acupuncture uses extremely thin needles and does not incorporate herbal medicine in its practice. Auricular acupuncture uses acupuncture points only on the ear, which are believed to stimulate and balance internal organs. In France, where acupuncture is very popular and more accepted by the medical establishment, neurologist Paul Nogier developed a system of acupuncture based on neuroendocrine theory rather than on traditional Chinese concepts, which is gaining some use in America. Acupressure — Form of massage using acupuncture points. Auricular acupuncture — Acupuncture using only points found on the ears. Chi — Basic life energy. Meridian — Channel through which chi travels in the body. Moxibustion — Acupuncture technique which burns the herb moxa or mugwort. Tonification — Acupuncture technique for strengthening the body. Chinese medicine views the body as a small part of the universe, and subject to universal laws and principles of harmony and balance. Chinese medicine does not draw a sharp line, as Western medicine does, between mind and body. The Chinese system believes that emotions and mental states are every bit as influential on disease as purely physical mechanisms, and considers factors like work, environment, lifestyle and relationships as fundamental to the overall picture of a patient's health. Chinese medicine also uses very different symbols and ideas to discuss the body and health. While Western medicine typically describes health in terms of measurable physical processes made up of chemical reactions, the Chinese use ideas like yin and yang, chi, the organ system, and the five elements to describe health and the body. To understand the ideas behind acupuncture, it is worthwhile to introduce some of these basic terms. YIN AND YANG. According to Chinese philosophy, the universe and the body can be described by two separate but complementary principles, that of yin and yang. For example, in temperature, yin is cold and yang is hot. In gender, yin is female and yang is male. In activity, yin is passive and yang is active. In light, yin is dark and yang is bright; in direction yin is inward and downward and yang is outward and up, and so on. Nothing is ever completely yin or yang, but a combination of the two. These two principles are always interacting, opposing, and influencing each other. The goal of Chinese medicine is not to eliminate either yin or yang, but to allow the two to balance each other and exist harmoniously together. For instance, if a person suffers from symptoms of high blood pressure, the Chinese system would say that the heart organ might have too much yang, and would recommend methods either to reduce the yang or to increase the yin of the heart, depending on the other symptoms and organs in the body. Thus, acupuncture therapies seek to either increase or reduce yang, or increase or reduce yin in particular regions of the body. CHI. Another fundamental concept of Chinese medicine is that of chi (pronounced chee, also spelled qi). Chi is the fundamental life energy of the universe. It is invisible and is found in the environment in the air, water, food and sunlight. In the body, it is the invisible vital force that creates and animates life. We are all born with inherited amounts of chi, and we also get acquired chi from the food we eat and the air we breathe. The level and quality of a person's chi also depends on the state of physical, mental and emotional balance. Chi travels through the body along channels called meridians. THE ORGAN SYSTEM. In the Chinese system, there are twelve main organs: the lung, large intestine, stomach, spleen, heart, small intestine, urinary bladder, kidney, liver, gallbladder, pericardium, and the "triple warmer," which represents the entire torso region. Each organ has chi energy associated with it, and each organ interacts with particular emotions on the mental level. As there are twelve organs, there are twelve types of chi which can move through the body, and these move through twelve main channels or meridians. Chinese doctors connect symptoms to organs. That is, symptoms are caused by yin/yang imbalances in one or more organs, or by an unhealthy flow of chi to or from one organ to another. Each organ has a different profile of symptoms it can manifest. THE FIVE ELEMENTS. Another basis of Chinese theory is that the world and body are made up of five main elements: wood, fire, earth, metal, and water. These elements are all interconnected, and each element either generates or controls another element. For instance, water controls fire and earth generates metal. Each organ is associated with one of the five elements. The Chinese system uses elements and organs to describe and treat conditions. For instance, the kidney is associated with water and the heart is associated with fire, and the two organs are related as water and fire are related. If the kidney is weak, then there might be a corresponding fire problem in the heart, so treatment might be made by acupuncture or herbs to cool the heart system and/or increase energy in the kidney system. The Chinese have developed an intricate system of how organs and elements are related to physical and mental symptoms, and the above example is a very simple one. Although this system sounds suspect to Western scientists, some interesting parallels have been observed. For instance, Western medicine has observed that with severe heart problems, kidney failure often follows, but it still does not know exactly why. In Chinese medicine, this connection between the two organs has long been established. MEDICAL PROBLEMS AND ACUPUNCTURE. In Chinese medicine, disease as seen as imbalances in the organ system or chi meridians, and the goal of any remedy or treatment is to assist the body in reestablishing its innate harmony. Disease can be caused by internal factors like emotions, external factors like the environment and weather, and other factors like injuries, trauma, diet, and germs. However, infection is seen not as primarily a problem with germs and viruses, but as a weakness in the energy of the body which is allowing a sickness to occur. In Chinese medicine, no two illnesses are ever the same, as each body has its own characteristics of symptoms and balance. Acupuncture is used to open or adjust the flow of chi throughout the organ system, which will strengthen the body and prompt it to heal itself. A VISIT TO THE ACUPUNCTURIST. The first thing an acupuncturist will do is get a thorough idea of a patient's medical history and symptoms, both physical and emotional. This is done with a long questionnaire and interview. Then the acupuncturist will examine the patient to find further symptoms, looking closely at the tongue, the pulse at various points in the body, the complexion, general behavior, and other signs like coughs or pains. From this, the practitioner will be able to determine patterns of symptoms which indicate which organs and areas are imbalanced. Depending on the problem, the acupuncturist will insert needles to manipulate chi on one or more of the twelve organ meridians. On these twelve meridians, there are nearly 2,000 points which can be used in acupuncture, with around 200 points being most frequently used by traditional acupuncturists. During an individual treatment, one to twenty needles may be used, depending on which meridian points are chosen. Acupuncture needles are always sterilized and acupuncture is a very safe procedure. The depth of insertion of needles varies, depending on which chi channels are being treated. Some points barely go beyond superficial layers of skin, while some acupuncture points require a depth of 1-3 in (2.5-7.5 cm) of needle. The needles generally do not cause pain. Patients sometimes report pinching sensations and often pleasant sensations, as the body experiences healing. Depending on the problem, the acupuncturist might spin or move the needles, or even pass a slight electrical current through some of them. Moxibustion may be sometimes used, in which an herbal mixture (moxa or mugwort) is either burned like incense on the acupuncture point or on the end of the needle, which is believed to stimulate chi in a particular way. Also, acupuncturists sometimes use cupping, during which small suction cups are placed on meridian points to stimulate them. How long the needles are inserted also varies. Some patients only require a quick in and out insertion to clear problems and provide tonification (strengthening of health), while some other conditions might require needles inserted up to an hour or more. The average visit to an acupuncturist takes about thirty minutes. The number of visits to the acupuncturist varies as well, with some conditions improved in one or two sessions and others requiring a series of six or more visits over the course of weeks or months. Costs for acupuncture can vary, depending on whether the practitioner is an MD. Initial visits with non-MD acupuncturists can run from $50-$100, with follow-up visits usually costing less. Insurance reimbursement also varies widely, depending on the company and state. Regulations have been changing often. Some states authorize Medicaid to cover acupuncture for certain conditions, and some states have mandated that general coverage pay for acupuncture. Consumers should be aware of the provisions for acupuncture in their individual policies. Acupuncture is generally a very safe procedure. If a patient is in doubt about a medical condition, more than one physician should be consulted. Also, a patient should always feel comfortable and confident that their acupuncturist is knowledgable and properly trained. Mainstream medicine has been slow to accept acupuncture; although more MDs are using it, the American Medical Association does not recognize it as a specialty. The reason for this is that the mechanism of acupuncture is difficult to scientifically understand or measure, such as the invisible energy of chi in the body. Western medicine, admitting that acupuncture works in many cases, has theorized that the energy meridians are actually part of the nervous system and that acupuncture relieves pain by releasing endorphins, or natural pain killers, into the bloodstream. Despite the ambiguity in the biochemistry involved, acupuncture continues to show effectiveness in clinical tests, from reducing pain to alleviating the symptoms of chronic illnesses, and research in acupuncture is currently growing. The Office of Alternative Medicine of the National Institute of Health is currently funding research in the use of acupuncture for treating depression and attention-deficit disorder. American Journal of Acupuncture. 1840 41st Ave., Suite 102, P.O. Box 610, Capitola, CA 95010. American Association of Oriental Medicine. December 28, 2000. http://www.aaom.org. North American Society of Acupuncture and Alternative Medicine. December 28, 2000. http://www.nasa-altmed.com. the Chinese practice of inserting needles into specific points along the “meridians” of the body to relieve the discomfort associated with painful disorders, to induce surgical anesthesia, and for preventive and therapeutic purposes. Acupuncture is generally used to treat functional disorders rather than organic diseases that bring about severe tissue changes. It may be used in combination with other therapies for treatment of degenerative diseases. Use of it as a form of anesthesia is considered by traditional Chinese practitioners to be a minor part of acupuncture practice. Advocates of acupuncture speak of the concept of a vital energy flow or life force (c'hi) which circulates through the body along meridians similar to the blood, lymphatic, and neural circuits. It is believed that there are two energy flows, which are in everything in the universe. Yang, the positive principle, tends to stimulate and to contract; yin, the negative principle, tends to sedate and to expand. Health depends upon the equilibrium of yang and yin, first in the body and secondly in the universe. The therapeutic objective of acupuncture is to rectify an imbalance in the energy flow. This is accomplished by the insertion of needles at specific points along the meridians. The needles are inserted in the skin to varying depths according to the point of insertion and the condition being treated. They may be left in place for varying lengths of time and are vibrated manually or electrically. Traditionally an East Asian practice, acupuncture is becoming accepted in Western countries as a valid form of therapy. There is some research support for the idea that the procedure produces an analgesic effect because it causes the release of enkephalin, a naturally occurring endorphin that has opiate-like effects. 1. An ancient Asian system of therapy in which long, fine needles are inserted into discrete areas of the body that are considered linked to symptoms or disease. 2. More recently, acupuncture anesthesia or analgesia. /acu·punc·ture/ (-punk″cher) a traditional Chinese practice of piercing specific areas of the body (acupoints) along peripheral nerves with fine needles to relieve pain, to induce surgical anesthesia, and for therapeutic purposes. Other means of stimulating the acupoints, including lasers, ultrasound, and electricity, may also be used. Korean hand acupuncture a type in which the hand is considered to be a representation of the entire body, and stimulation of specific points on the hand is used to obtain effects in distant areas of the body. a traditional Chinese method of producing analgesia or altering the function of a body system by inserting fine, wire-thin needles into the skin at specific body sites along a series of lines, or channels, called meridians. Acupuncture is highly effective in treating both acute and chronic pain associated with multiple causes. In addition, common conditions are effectively treated, including sinusitis, allergies, tinnitus, sore throats, hypertension, gastroesophageal reflux, hyperacidity and peptic ulcer disease, constipation, diarrhea, spastic colon, urinary incontinence, urinary tract infection, premenstrual syndrome, infertility, dysmenorrhea, memory problems, sensory disturbances, depression, anxiety, and other psychological disorders. It is sometimes used with moxibustion. acupuncturist, n.
A system of healthcare which has been practised in China for more than 4000 years. 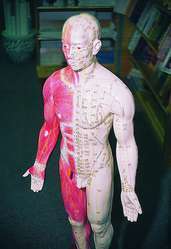 Acupuncture is said to balance the body’s ‘life force” by inserting fine needles in or beneath the skin at one of 365 to 2000 points, where horizontal and vertical “energy” lines meet along the 12 or 14 major meridians; these lines and points are said to represent various internal organs or tissues. While acupuncture can relieve pain and produce surgical anaesthesia, the data supporting its efficacy is weak. Acupuncture appears to provide relief for diabetic neuropathy. • Gate theory: acupuncture needles may block the flow of pain along a neural pathway other than the normal for pain sensation. Reports—anecdotal and otherwise--suggest that acupuncture may be effective in treating such diverse conditions as addiction disorders, agoraphobia, allergies, angina pectoris, anorexia, anxiety, arthritis, bronchitis, bruxism, bunions, common cold, dry mouth, dysmenorrhea, eczema, emphysema, fatigue, fluid retention, GI-tract problems such as N&V and irritable bowl syndrome, hay fever, headaches, hypotension, hypertension, infertility, insomnia, depression, migraines, painful conditions, neuralgia, mood swings, obesity, panic attacks, periodontal disease, post-partum depression, PMS, prostate disease, sciatica, slipped or prolapsed vertebral disks, renal disease, sexual problems, sinusitis, sports injuries, stasis (decubitus ulcers), stress, thyroid disease, tinnitus, tooth extraction, vertigo, warts, weight gain or loss. 1. An ancient Asian system of healing that uses long fine needles. A branch of Chinese medicine, now also used by some Western doctors, in which needles are inserted into the skin at certain points to produce ANAESTHESIA and, it is claimed, to treat disease by a process described as ‘unblocking’ of bodily meridians. These meridians, however, have no physical existence and the process does not appear to have any scientific or logical basis as a form of therapy. The psychological and suggestional effects of such a procedure may, however, be considerable and the occurrence of temporary changes is to be expected in some patients. There are more substantial grounds for the use of acupuncture as an anaesthetic agent as it is known to cause a release of ENDORPHINS. But it is an unreliable method of inducing anaesthesia and is not used when conventional scientific methods are available. Acupuncture has acquired a reputation as a treatment for headache, especially migraine. A difficulty in testing this is that trials that appear to support the hypothesis cannot easily include comparable sham acupuncture and are thus uncontrolled. See also ALTERNATIVE MEDICINE. the practice of inserting fine needles into specific parts of the body for therapeutic purposes, as in traditional Chinese medicine. Energy known as qi is believed to flow through channels ('meridians') linked to particular organs and functions; along these, needles are inserted at selected points to stimulate or depress the energy flow. Used in the treatment of a variety of diseases, for relief of pain or for production of anaesthesia. n a practice in Chinese medicine in which the skin, at various points along meridians, is punctured with needles to remove energetic blockages and stimulate the flow of qi. Often used to relieve pain. See also acupoints, meridians, and qi. n the pain-reducing effect brought about by inserting tiny needles into key points of the human body, sometimes augmented by the use of low-frequency or high-frequency electrically charged needles. n in medical acupuncture, a fusion model of therapy that brings together local treatment with energy assessment throughout the body's channels. Primarily used in the United States, this model of therapy is derived from the European interpretations of the traditional Chinese methods and blends segmental innervation for pain therapies and neuromuscular anatomy of trigger points. n therapy in which acupuncture points on the outer ear are treated to alleviate symptoms such as depression, insomnia, sexual dysfunction, and withdrawal symptoms. n a hybridization of Chinese acupuncture and the Vedic chakra system in which the chakras are stimulated and energetic blockages are released through the needling of chakra points. n a variant of acupuncture in which practitioners translate and refer to original texts and rely on the philosophical as well as medical, aspects of those texts. n therapy that treats and prevents disease by stimulating certain points on the ear. Standardized ear acupuncture is used to treat substance abuse in the United States. n.pr a variant of acupuncture in which diagnosis is based upon the patient's unique relationship to the five elements (wood, fire, earth, metal, and water). The acupuncturist determines the patient's constitutional element and works to return this element to a state of balance. n technique in which the specific acupuncture points are fixed to promote uniformity for determining efficacy of a technique. See also acupuncture. n method in which needles are inserted into the hands at points that correspond to the traditional Chinese meridians. n healing system based on Western views of neurophysiology, neuroanatomy, and trigger points in combination with European interpretation of Chinese classic medicine texts. n 1. system of acupuncture in which the body is reflected in miniature on different parts of the body, as with reflexology. 2. a term used by Felix Mann to describe his techniques of minimalist acupuncture. See also acupuncture, minimalist and acupuncture, new concept. n a Western variant of acupuncture with a modern neurological orien-tation. Includes the use of electroacupuncture and is predominantly performed by medical doctors for pain relief. n a form of acupuncture in which meridians and classical points are eschewed and instead local tenderness and the pattern of radiation are used to locate proper sites for needle insertion. This school of acupuncture also uses micro acupuncture and periosteal needling. See also micro acupuncture. n method of acu-puncture in which the needle is inserted all the way into the periosteum (fibrous tissue which encases bone). Special care is taken in the vicinity of organs. n the insertion of fine needles into meridians located throughout the scalp to restore health and balance to the body. n method of acupuncture in which the needles are inserted into the skin and subcutaneous tissues only. n a form of acupuncture applied as a first-aid technique for its analgesic properties. n a form of acupuncture that uses trigger points for needle insertion instead of the classical acupuncture points. See also points, trigger. n.pr technique developed by Toshikatsu Yamamoto in which filiform needles are inserted into meridians located on the scalp. Ancient Asian system of therapy in which long, fine needles are inserted into discrete areas of the body that are considered linked to symptoms or disease. n a method of producing analgesia or altering the function of a system of the body by inserting fine, wire-thin needles into the skin at specific sites along a series of lines or channels called meridians. The needles may be twirled, energized electrically, or warmed. the Chinese practice of inserting needles into specific points (acupoints) along the 'meridians' of the body and manipulated to relieve the discomfort associated with painful disorders, to induce surgical anesthesia, and for preventive and therapeutic purposes. It is proposed that acupuncture produces its effects by the conduction of electromagnetic signals at a greater-than-normal rate, thus aiding the activity of pain-killing biochemicals, such as endorphins and immune system cells, at specific sites in the body. Studies have also shown that acupuncture may alter brain chemistry by changing the release of neurotransmitters and neurohormones and affecting sensory perception and involuntary body functions. In recent years, the techniques have been adapted for use in veterinary medicine. includes cups for vacuum creation, needles, hot needles, moxibustion, electronic heating devices, coolant spray, ultrasound, electroacupuncture machines, laser equipment. See accumulation points, alarm points, association points, auricular points, diagnostic points, horary points, local points, luo points, sedation points, source points, special action points, tonification points. Q. Is acupuncture effective. I heard about a Chinese origin treatment called acupuncture. One of my friends who suffer from wheezing tried with this treatment and considers the treatment to be very slow. Is acupuncture effective? A. NO… It is not effective in the hands of children. Yes… as long as you are totally honest about your symptoms to your doctor. Q. Acupuncture during chemo - any experience? My friend receives chemo for breast cancer, and it makes her quite nauseus. Doctor offered her to take drugs against the nausea, but I thought she can try natural thing before she put another toxic thing in her body. Does anyone have an experience with this? Does it help? A. It’s very personal. Some people say it helped them very much, and some say it helped only their therapist bank account. You can try it and see if it helps. Just make sure to consult your doctor, because it may be dangerous to do acupuncture during chemo.